For the purpose of this question I do not want to focus simply on the fact that there will be less "night time" for the panels while in orbit/outside the atmosphere of a planet. 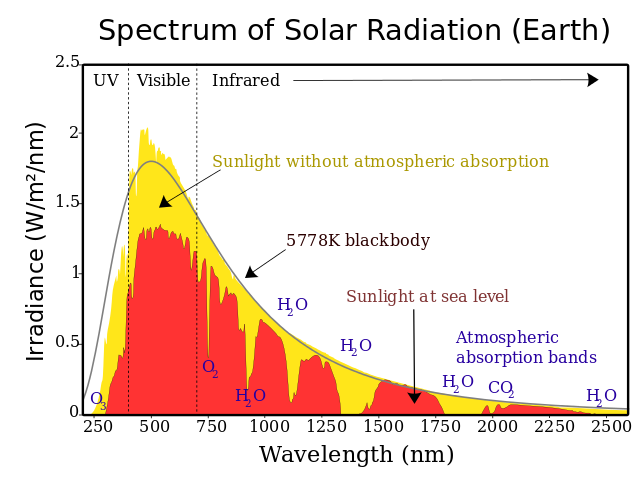 Understanding how much our atmosphere will actually absorb/deflect the incoming solar radiation. How much of a reduction in power are we looking in relation to AU? E.G. Would a solar panel on a plane halfway to the karman line see significant improvement in power? Is there any atmospheric composition in our solar system that would reduce the amount of solar energy available at the surface moreso than Earth? When 1361 W/m2 is arriving above the atmosphere (when the sun is at the zenith in a cloudless sky), direct sun is about 1050 W/m2, and global radiation on a horizontal surface at ground level is about 1120 W/m2. Not the answer you're looking for? Browse other questions tagged atmosphere solar-power or ask your own question. How does the efficacy of solar cells on Mars compare with Earth?